JYYF runs six Reginals and one National in 2013. Contestant can compete in ONLY one Regional, but wherever they want. 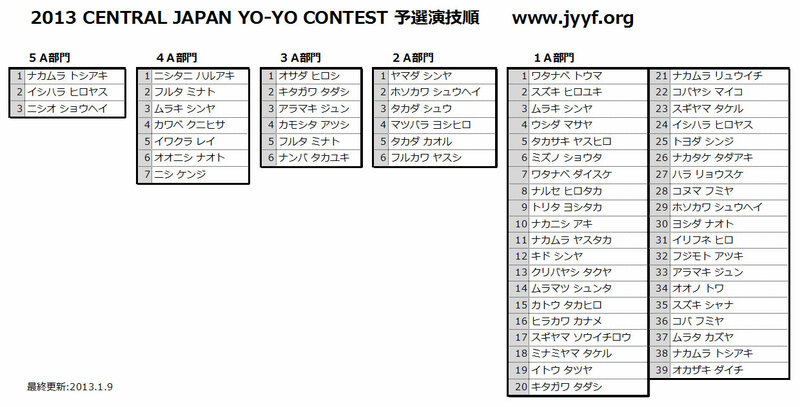 Only the top 10 of Regionals, the finalists of 2012JN and top 5 of 2011JN can compete in 2013JN. Six regional champions of each division will be seeded to 2013JN Final. No yo-yoing on stage before the music starts. No throw-downs, no adjustments. No starts with sleeping or mounting position allowed. Catch yo-yo(s) immediately after the music ends. If the player cannot catch, deductions happen until the player leaves the stage. No getting off the stage during the performance, even for getting yo-yos the player lost from the stage. If the player steps off from the stage, the performance ends there. No sitting on the edge of the stage. No standing on the edge. Can be DQed. No props allowed. Only yo-yos, strings, counter-weights, gloves, and tray (contest provides). No bags, yo-yo cases, clothes, jackets, tables on the stage. For supervising belongings reason, bag, wallet, cell phone allowed on the end of the stage. No additional points for rareness, originality, style, continuity, largeness and etc. 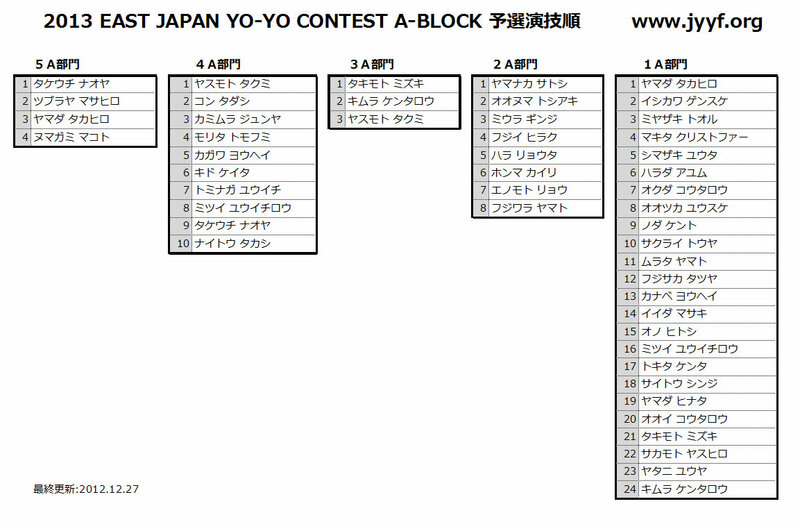 Restart (yo-yo stop), and yo-yo change will be subject for deduction later. ・ At the end of routine, if yo-yo does not come back to hand, it will be Minus 3 deduction. このサイトの著作権は別段記載のない限り、「JYYF(日本ヨーヨー連盟)」が所有しています。Copyright (c) 2006-2013 "JYYF (Japan Yo-Yo Federation)" All rights reserved.